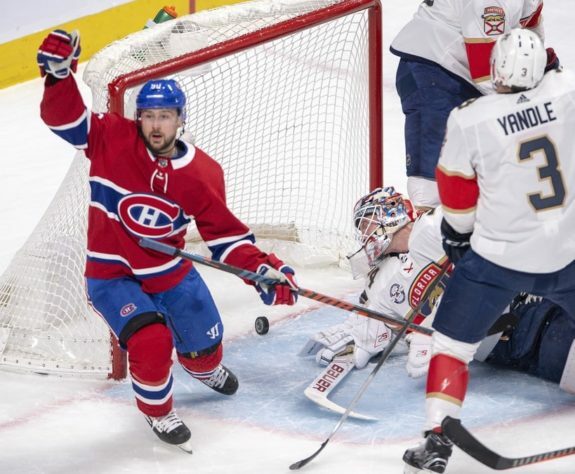 MONTREAL — Tomas Tatar scored twice and added an assist to lead the Montreal Canadiens to a decisive 6-1 victory over the Florida Panthers on Tuesday night to remain in a playoff position. Brett Kulak, Artturi Lehkonen, Phillip Danault and Max Domi also scored for the Canadiens (41-28-8), who have won four of their past five games. Carey Price stopped 33-of-34 shots in his ninth consecutive start. Price has allowed 13 goals in his past eight games. Frank Vatrano scored the only goal for the Panthers (33-32-12), who were officially eliminated from playoff contention. James Reimer, who had not played in exactly one month, was pulled in the first period after allowing three goals on nine shots. His replacement Sam Montembeault stopped 15-of-18 shots. The Habs controlled Tuesday’s contest despite being outshot 34-27. Tatar got the ball rolling at 6:58 of the first period when he beat Reimer with a shot off the post and in on a feed from Andrew Shaw behind the net. The home team went up 2-0 through Kulak’s one-timer at 12:39 for the defenceman’s fifth goal of the season. Tatar added another for Montreal less than two minutes later when he shovelled a loose puck in the crease past Reimer, who mishandled Shea Weber’s initial shot from the point. The Canadiens took a 4-0 lead when Lehkonen’s shot deflected slightly off Aleksander Barkov’s stick at 2:52 of the second. Left alone in the crease, Danault scored Montreal’s fifth of the game when he squeezed a puck between Montembeault’s pads from the doorstep at 12:40. With a pass on Danault’s goal, Tatar set a new personal record with 57 points in a season. Price did his part to keep his side in the game, making the occasional breakaway or 2-on-1 look easy. The only player to beat Price was Vatrano, who scored his 23rd goal of the season at 1:35 of the third period, on the power play. Domi made it 6-1 with a wrist shot from the face-off dot to the left of Montembeault with 8:12 left in the game.